Indirasite: Few important things that we need to know about Women’s day. Few important things that we need to know about Women’s day. reason behind the celebration is to acknowledge and respect the values of women with appreciation and love toward their contribution to the social and economic development. Every year, this day is observed with the specific theme for the advancement and encouragement of the women's. The theme of the year 2017 is internationally given as the be Be Bold for the change. The disparity between the male and female still exist in the business, professional life and with any working environment regarding their wages and payment issues, facilities and promotional issues. The theme of Be Bold for Change is a theme to inspire the women to change the world motivating them how to be strong, courageous, confident to face the challenges and to make a change that may happen for the sake of women or for women’s rights. The month of the march marks the day of International women's day, this year many events are going to be happening on in order to make a change in the women’s life, to evaluate their past achievements and to honor and commemorate the women who fought for the women’s right and established the historic day throughout the series of march in the history. A day without a woman march is going to happen on the day of Women’s day. “A Day without a woman’ is a strike called for the day of International women day, which is going to be organized by the stunningly successful Women’s March in January. 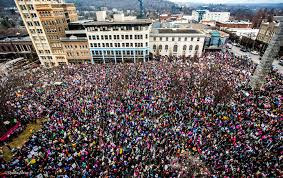 The organizer has explained;’ anyone anywhere can join… in one call or all of the following ways;1) Women take the day off from paid or unpaid labor; 2) Avoid shopping for one day ( with exceptions for small, women- and minority-owned business); 3) Wear Red in solidarity with A Day without a woman”.